Easy Riders Rentals offer a wide selection of motorbikes , scooters, quad bikes & buggies for hire and we can fulfill the needs for all. Easy Riders Rentals also arrange Extreme Quad Bike & Buggy Safari’s in and around Ayia Napa. Established since 1994 Easy Riders Rentals is situated in the middle of the Ayia Napa square and in those 22 years we have created a excellent reputation in Cyprus and abroad as the leaders of rentals & sales of motorbikes, quad bikes & buggies. 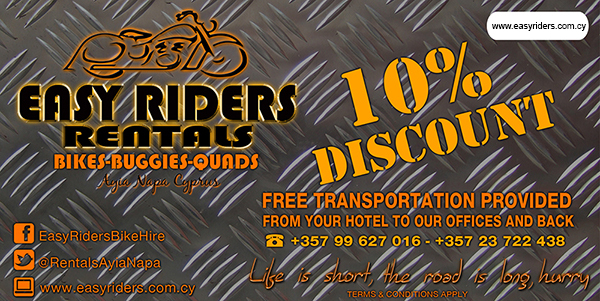 Easy Riders are recommended by the biggest tourists magazines, websites and apps in Cyprus as the only trusted and reliable rental company on the island and they even have a celebrity following. What makes Easy Riders so special though is that by far they offer the biggest selection of motorbikes, scooters, quad bikes & buggies in Ayia Napa with nearly 300 brand new vehicles to choose from giving you peace of mind while you are out and about, On top of that though there’s Collision Damage Waiver Insurance, 24 Hour Free Road Side Service, Unlimited Mileage, Free Helmets & Road Maps and Extra Padlocks For Vehicle Security included. For your convenience Easy Riders accepts all major Credit Cards and offers Competitive prices along with further discounts for group Bookings. Free transportation can also be provided by calling 00357 99627016 or 00357 23722438 Mon – Sat: 10 am – 7 pm & Sunday: 11 am – 5.30 pm. We will pick you up from your hotel and bring you to our office to collect you vehicle and drop you back again once you hire is finished and you return the vehicle. As you would expect from a quality company such as Easy Riders Rentals safety & client satisfaction are paramount and all the motorbikes, Scooters, Quads Bikes and Buggies that we rent out are imported directly by us as we have all brand rights for KYMCO, PGO, TGB, ACCESS & ADLY. All bikes, quads and buggies are checked, cleaned and ready to drive before given to the customer & most of our vehicles have GPS trackers and in fact Easy Riders is the only rental company offering GPS trackers in Cyprus. We also have our own in house service team who can quickly resolve mechanical problems and regular servicing is undertaken by our trained professionals with only original parts. So if you looking for a peace of mind quality rentals company there really is little to compare to the great service & choice offered by Easy Riders Rentals and to help you enjoy our customer friendly service you can even get a Smashing 10% Discount On Your Hire Just For Clicking Here & save it to your device or even print it out and bring it along with you. Why not check out what our customers have to say about us by visiting our review page on Facebook. You can also follow us on Insatgram and for more information visit our Website for additional information, prices & pictures and of course our special offers.